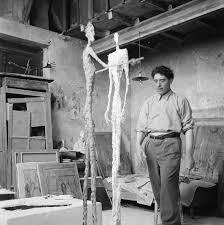 Giacometti was born today in 1901 in the Italian speaking part of Switzerland. Over his 64 years, he was an artist in the true sense of the word. His creativity included painting, printmaking, drafting, and my favorite - sculpting. His tall bronze sculptures with names such as Man Walking or Standing Woman are very simple but thought provoking. Interestingly, Giacometti scholars note that the long-legged male statues are all in movement while the equally thin women are passively standing. Christie's auction sold his 1947 "Pointing Man" statue for over $141 million in May of 2015. If in Chicago, visit The Art Institute's room full of these iconic figures.